The Federal Reserve, often referred to as "the Fed," is the central bank of the United States, established in 1913 by the Federal Reserve Act. The Fed sets and implements monetary policy in the United States through various complex mechanisms broadly referred to as "open market operations," which generally involve selling or purchasing federal securities on the financial markets in order to achieve a desired outcome, such as moving the market short-term interest rate to a desired level. Actions taken by the fed may also have the practical effect of changing the proportion of reserves that a bank must keep on hand to cover deposits, which in turn affects the money supply. Through the use of these various mechanisms, the Fed endeavors to manage inflation, avoid deflation (which can have disastrous consequences for an economy), and generally encourage moderate, stable economic growth that is minimally susceptible to a "boom/bust" cycle. This is, of course, all extremely complicated, even for financial professionals. Worse, it's boring. Conspiracy theorists therefore offer a more exciting and easily digestible version of events, in which the Fed is a front for a shadowy cabal to fund wars and enforce the iron will of the Jewish banking conspiracy. Not only is this much more exciting, it can also be understood by watching a bunch of YouTube videos over the course of a weekend, as opposed to all of that boring crap that takes serious academic study to truly wrap your head around. From 1836, when the Second Bank of the United States lost its congressional charter, to 1913, when the Federal Reserve Act passed, the U.S. was without a central bank. Major financial panics (and their accompanying recessions) occurred in 1873, 1884, 1893, 1901, 1903, and the Panic of 1907 led to a demand that Congress take action. The Aldrich Commission was dispatched to make a study, and shortly after its final report was made Congress changed hands from the big government Republicans (those were the days) to the more grassroots-oriented and anti-federalist Democrats. Instead of one central bank located in New York as the Commission recommended, twelve regional banks were created throughout the country, with a Board of Governors, which is the bank's present form. The purpose of the Federal Reserve has evolved since its creation. When created The Fed was a decentralized central bank and its primary tool for conducting monetary policy was the Discount Rate. Since WW2 it has gained more independence, become more centralized, and has developed a much clearer mission. In the 21st century its primary objectives are protecting the economy from inflation, ensuring financial stability, and keeping unemployment low. The Federal Reserve is responsible for controlling the amount of cash money in the United States and sets monetary policy while acting as a "banker's bank". In reality, a good deal of money creation occurs outside the Federal Reserve and it can only indirectly influence the money creation process. While the the Federal Reserve is often accused of "printing money" it can only create digital bank reserves. The Federal Reserve cannot actually create any physical currency. That process is undertaken by the Bureau of Engraving and the Bureau of the Mint. The Fed's only major involvement is getting the physical currency into circulation. The Federal Reserve has 12 branch banks (Boston, New York, Philadelphia, Cleveland, Richmond, Atlanta, Chicago, St. Louis, Minneapolis, Kansas City, Dallas, and San Francisco). They help move currency into circulation, conduct economic research, enforce regulations, hold deposits and loan money to banks within their respective regions. This money is then lent at an interest rate to banks who then lend it to people and businesses. Regarding monetary policy the Federal reserve had three primary quantitative tools. The first is the open market operations, intended to control inflation and guide interest rates. The Fed buys bonds which speeds up the money creation process and induces inflation by putting more money into the economy. Conversely it can sell Treasury Bonds to take money out of the economy and slow down the money creation process. The Fed is being less accommodative in supplying reserves, or Federal Reserve Notes, making it more costly to borrow and lend. Previously the money supply was effectively in the hands of various private companies and Wall Street movers and shakers (e.g. JP Morgan during the panic of 1907). The 2nd major tool is the Discount Rate. This is the rate of interest the Federal Reserve charges banks for the loans it gives out. Finally there is the "Reserve Requirement". Banks of a certain size are required to keep a certain amount of their total deposits on hand at all times, usually about 10%. Smaller banks are exempt from this. Keeping the requirement low allows banks to lend more. The Fed very rarely changes the Reserve Requirement. The Federal Reserve also has a a few unconventional tools and other jobs. 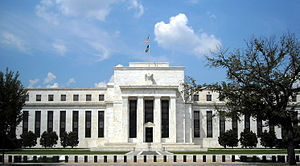 The Federal Reserve system supervises and regulates banks, offers banking services, and engages in economic research. The most famous, or infamous, unconventional tool The Fed possesses are its Large Scale Asset Purchases, more commonly knowns as Quantitative Easing. During a recession a central bank tends to ease up on monetary policy and reduce interest rates. When short term interest rates are already at their lowest possible point the economy is considered to be at the zero lower bound. For some this means the central bank is "out of ammo" and that there are no other effective monetary solutions to combating an economic recession. However though LSAPs a central bank gets involved in the creation of large amounts of base money and begins purchasing medium term securities and toxic assets to influence medium or long term interest rates. The Federal Reserve controversially engaged in three rounds of this since the Great Recession. In general the program is thought to have worked. Oh, the irony! The chairman of the Federal Reserve Board for two decades (1986-2006) was Alan Greenspan, a former disciple of Ayn Rand. During the banking crisis of 2008, the answer to "What does it do?" became "buy loads of toxic assets from failing banks." The Fed created a number of dummy corporations (sorry, "special purpose vehicles") called Maiden Lane I, II, and III to buy up crap from Wall Street and government-sponsored entities Fannie and Freddie. Some question the legality of the Fed's actions, however the Federal Reserve Act of 1913—Section 13(3) gives it authority "under unusual and exigent circumstances" to extend credit to individuals, partnerships, and corporations. A subsequent, full audit of the Fed revealed numerous alleged conflicts of interest in the deals. After drastically increasing the size of its balance sheet, in what became nicknamed the "backdoor bailout," the Fed was able to provide $3.3 trillion in liquidity and a peak of over $9 trillion in short-term loans and assistance to Wall Street firms and foreign central banks, over several years. Total commitments were over $29 trillion, an amazing feat considering the GDP of Earth is estimated at $70 trillion. There are many criticisms of the Fed, varying in levels of coherence. Some criticism arises from a conspiratorial worldview that falsely attributes malicious motives to the Fed instead of incompetence or bad luck. The American monetary system is difficult to understand, even for someone in the financial industry and/or someone with an advanced degree. In fact, many principles that people were taught in schools before the 2008 crisis were turned on their head (e.g. big bank debt was risk free). The 2008 crisis and subsequent growing income inequality has furthered a greater distrust of the Federal Reserve. Marriner S. Eccles building, the Fed's headquarters. (Fedquarters?) This is where the bankstahs plot to sell your children into debt slavery. The Fed has been a frequent subject of conspiracy theories alleging the Fed deliberately creates inflation, recessions, and even the Great Depression, through manipulation of the money supply. Father Coughlin, the John Birch Society, Liberty Lobby, Eustace Mullins, Pat Robertson, Alex Jones, Texe Marrs and several others have frequently expressed such conspiracy theories. Many of the popular claims made today are recycled from G. Edward Griffin's The Creature from Jekyll Island. In some (but not all) cases these conspiracy theories have an anti-Semitic component, alleging "Jews" secretly or openly control the Fed. These theories are furthermore sometimes tied in to other conspiracy theories about the Trilateral Commission or the New World Order, or manipulation of the U.S. economy by the Rockefeller and Rothschild banking families. The extent to which banks "control" the Federal Reserve is that they technically "own" it, but not in the way that shareholders own Microsoft. Since the Federal Reserve was created by Congressional charter, they are not organized like a normal corporation. Shareholder banks have no voting power, and all decisions are made by aforementioned government-appointed policy wonks. Shareholder banks elect 6 out of the 9 members of each regional Federal Reserve Bank's directors, but these regional directors have no power over monetary policy; that power lies solely in the hands of the central Board of Governors. However, the Board of Governors are appointed by lists which are given to the President by the staffs of banking committees of Congress and private sources. The most powerful of these groups are the financial institutions (which includes prominent members of the Fed itself) and the media corporations over which they have control. Thus, the appointment of these members is highly susceptible to political interests. The President does not select these people from his own personal address book, nor does he ask the public to submit nominations. Some monetary conspirators claim that the Fed creates money out of nothing and lends money to the government at interest, thereby stealing "the people's" money and selling us into debt slavery or some similar nefarious scheme to take over the US government. The way this works, however, is not quite the same as your regular commercial bank. The interest on debt held by the Fed actually goes to two places: One, the Fed pays itself out of this interest to cover its own operating costs, and two, the rest of the interest is rebated to the Treasury. Typically, the Congress authorizes the U.S. Treasury to issue debt obligations, usually 90 day T-bills or longer term bonds, to cover its operating deficit. The Federal Reserve then purchases these obligations out of its reserve account with Federal Reserve Notes, aka U.S. currency. This usually ties into the above point. The basic idea is that the Constitution gives Congress the power to coin money, so the Fed is unconstitutional because it is not the Congress. This is a pseudolegal argument because the Congress may delegate its powers. This is similar to pseudolegal arguments made by gold bugs. It also raises the question that if they were right, then do all 535 members of Congress (or 541, counting the non-voting delegates) have to personally make the coins and bills? Sometimes a big deal is made of the fact the law bringing the Fed into existence was passed December 23, 1913, implying that most of the Congress was away for Christmas. The reality is quite different -- the House passed the law 298-60, with 76 not voting but with 34 announced pairs, while the Senate passed it 43-25, with 27 not voting but with 12 announced pairs. For those not aware, an announced pair is where a member of the House or Senate who will be absent arranges with another member who who will be present and is on the opposite side of the issue to form a “pair” with the absent member, thus allowing the absent member to have recorded how he would have voted had he been present. This means that at best only 42 more House members and 15 more Senate members could have said no to the creation of the Fed. Although the vote would have passed even had everyone been present, some whale.to denizens claim that legislating on one of the last days of the session circumvented the possibility of challenges and debate. Why Congress would meet on days it thought off-limits when the two houses could, each with the consent of the other, choose to adjourn is beyond them. Much of the opposition to the Fed in non-conspiratorial circles (though there is some overlap) comes from the Austrian school, who are free banking proponents and generally draw on Ludwig von Mises' arguments against central banking. Ron Paul is particularly known for his multi-decadal anti-Fed crusade in Congress. In short, they claim that the Fed creates the business cycle through the expansion of the money supply which leads to "market distortion" and "malinvestment" due to easy money. The biggest flaw with the free banking proponents is they either are ignorant or ignore the many problems seen in the Free Banking Era of the US. The first problem was that during this era banks issued bank notes based on the gold and silver in their vaults, effectively printing money. Since these bank notes could only be redeemed at face value at the bank that issued them the result was the actual value of the note decreasing the further from the bank it got. Then there was the issue if the bank failed these bank notes became worthless. This made any form of long distance commerce difficult, if not impossible. The second problem was since the laws were set up by the individual states there was no consistency with regard to reserve requirements, interest rates for loans and deposits, capital ratios, or anything else. Worse, enforcement of what laws there were was highly variable within a state. This resulted in some states what was later called "wildcat banking," where the bank notes were not backed by precious metal at all, but by mortgages or bonds. In other words the exact same problems as are claimed regarding the Fed but with even less oversight. Before the Crash of 1929, the term "Great Depression" referred to the period of 1873–96 which was marked by deflation (largely because the US shifted from a bimetallic standard to a de facto gold standard in 1873) and the rapid industrialization of the country. The term Gilded Age is also applied to this period and sometimes in a pejorative manner -- a shiny golden cover hiding a rotting or rotted core. The deflation that marked this period is why some wanted to return to a bimetallic standard, as hammered home in William Jennings Bryan's Cross of Gold speech in 1896. Even the shorter range of 1873–79 stated by the NBER is longer than the 1930's Great Depression by 22 months. This era is now called "the Long Depression"; the lesson it gives us is that switching over from a bimetallic standard to a gold standard (which the Coinage Act of 1873 effectively did) triggers deflation for extended periods of time. The US only saw three major banking crises after the establishment of the Fed (Great Depression, S&L crisis, 2008 financial crisis) and only two since the creation of federal deposit insurance, compared to one about every decade prior to that. The business cycle had also seen shorter and smaller contractions. Essentially, what this demonstrates is that the minority of libertarians and Austrian schoolers who believe in free banking, like Ron Paul seem to love the idea of going back to the 19th century and having us all stuff gold bricks under our mattresses every time it looks like there's going to be a run on the bank. Louis Thomas McFadden, a former United States Congressman and a former Chairman of the United States Banking and Currency Committee who believed that Jewish bankers were plotting with others against the United States, testified before Congress in 1934 outlining his criticism of the Fed. He also submitted a petition for articles of impeachment against the Board of Governors of the Federal Reserve Banking System for numerous criminal acts including conspiracy, fraud, unlawful conversion, and treason. These charges went exactly nowhere. Ron and Rand Paul have been trying to shove legislation requiring an audit of the Fed and a review of its monetary policy (apparently independence from the political bickering on the Hill is a bad thing after all) through Congress since 2011. Although three versions of this legislation have passed the House, they all failed miserably in the Senate. The 2015 version was a fail, with Bernie Sanders even voting on it. Fractional-reserve banking: Controlled by the Jews or selling us into debt slavery... or something. Milton Friedman: Wrote the first definitive history of the Fed. Zeitgeist: Helped to revive the conspiracy theories. ↑ Roughly corresponding to the Gilded Age so beloved among certain libertarians. ↑ Essentially the progressive Republicans who were the heirs to the Radical Republicans and the predecessors of the Rockefeller Republicans; Theodore Roosevelt-types. ↑ The Federal Reserve buys Treasury Notes and Bonds on the Open Market by issuing Federal Reserve Notes aka. an "accommodative stance." Milton Friedman describes Federal Reserve Notes as "receipts for taxes paid." ↑ Gagnon, Joseph, et al. "Large-scale asset purchases by the Federal Reserve: did they work?" (2010). ↑ Gilchrist, Simon, and Egon Zakrajšek. "The Impact of the Federal Reserve's Large‐Scale Asset Purchase Programs on Corporate Credit Risk". Journal of Money, Credit and Banking 45.s2 (2013): 29–57. ↑ $29,000,000,000,000: A Detailed Look at the Fed’s Bailout by Funding Facility and Recipient, James Felkerson, University of Missouri–Kansas City, December 2011. ↑ The Fed's dual mandate dates to a 1946 act, Washington Post. ↑ The Federal Reserve Act of 1913 - A Legislative History, Law Librarians' Society of Washington, D.C.
↑ http://www.llsdc.org/assets/FRAdocs/fra-lh_v51-cr-1487-1488-sen.pdf For bonus points, some of the actual "circumvented" debate. ↑ See the Wikipedia article on List of banking crises. ↑ Even Friedman didn't want to get rid of the Fed. He actually proposed replacing it with a computer that would just spit out money as economic growth occurred. This page was last modified on 26 February 2019, at 02:51.